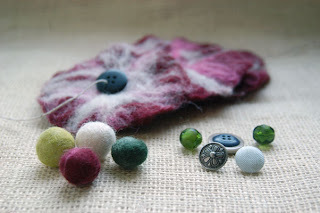 It's a perfect time to create a felted wool flower brooch. It will be a great addition to any party dress or holiday outfit. 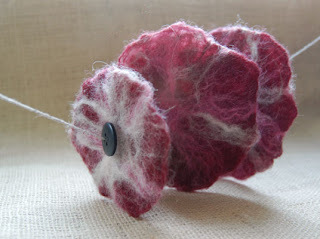 A felted flower brooch is not hard to make and it can be created at home using just soap and water. First of all we will need felting wool in different colors. It can be purchased at either Ben Franklin or on-line at AshlandBay. For a flower brooch I normally create a few layers of felt to make the brooch soft and fluffy. To create a layer we will need to lay wool flat on a plastic surface and wet if with warm water and soap. It makes sense to mix different colors of wool to create interesting combinations of new colors. Hand felting is a little bit like painting. You mix colors and get something amazing at the end! For the wool to felt we will need to press and stroke it gently with our palms adding water and soap if needed. It will take a good 15 minutes for each layer to felt. When we cannot separate wool fiber any more and our layer is more or less intact it’s time to stop. 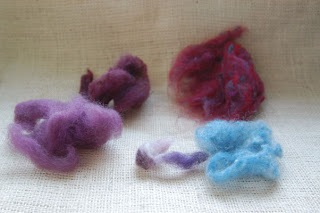 Our wool has felted. Let's rinse our layers with water and squeeze them gently so that all the water gets out. Now it's time to take a break and let our layers dry. I normally leave my hand felted pieces overnight to dry well. Once our layers of felt are dry and soft we can start creating an actual brooch. For our brooch to be beautiful and unique we can use beads, felted balls, buttons, wood pieces and pretty much anything we can find in our home. I personally like to attach big buttons in the middle of my brooches to make them look more like flowers. Don't forget to attach either a safe pin or a special brooch pin in the back of the brooch. They could be purchased at Ben Franklin as well. 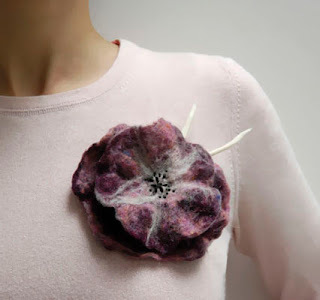 Felted flower brooches are great accessories. They add style and color to any outfit. I promise people will turn their heads when you wear a hand made flower brooch. It's so great to know that this pretty and chic brooch was actually created with your own hands! This post was written by TonyaUtkina at CityCrochet. You can read more about felting on my blog. Great tutorial, I can not wait to make it! beautiful flower brooch! Thank you! Thank you so much for sharing! Those brooches are amazingly beautiful.